I have taken Boo hiking in the snow in sneakers and jeans. And I’ve carried her back inside and picked ice off her socks, too. I don’t recommend it. Keep an eye on your little kid. They’re not as good at recognizing when they’re cold if they’re having fun. I’ve had good luck with “Are your toes (fingers, ears) a little cold or a lot cold?” Lips will turn purplish, hands will be tucked next to legs, noses and ears will be cold to the touch. Obviously, dress appropriately. Boots, snowpants, hat, mittens, coat as warm as you are wearing. Remember that their shoes and legs are shorter than yours. 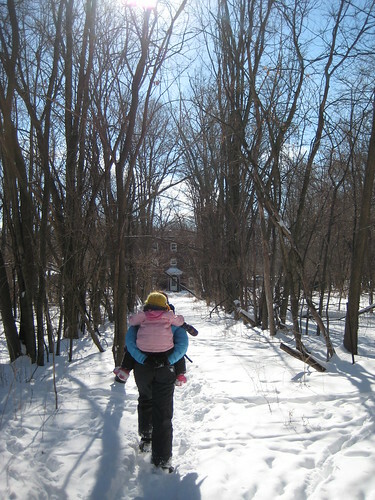 When tennis shoes or low boots are fine for an adult, your kid may need boots and snowpants. Did you mother tell you “If your feet are cold put a hat on”? Do it. 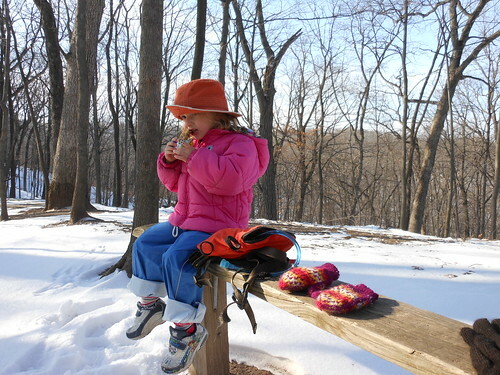 A nice wool hat will work wonders for winter hiking ability. It can be really hard to keep kids in a hat, so make sure it’s one that fits and suits your kid’s sense of style. We’ve had the best luck with bright yellow with eyes and a ducky beak. (As with everything, bright colors make it easier to keep track of when it’s flung into the woods.) If the hat is refused, occasionally offer it again, reminding them that it will keep them warm. 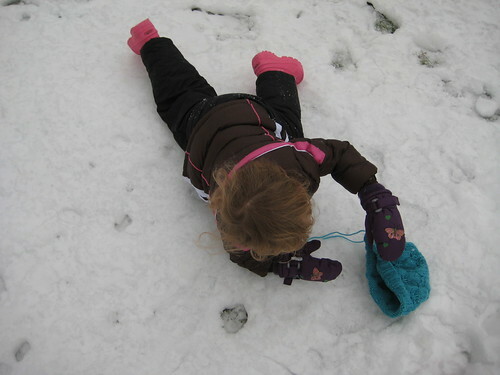 Kids run with their hands out, they touch snow, they fall and catch themselves in icy puddles. 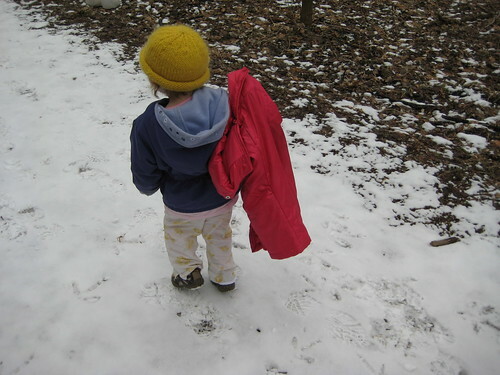 Put mittens on at the beginning of any hike where you will eventually put your hands in your pockets. Yesterday, we were out riding bikes. It was sunny and 50-55F. And windy. The kids’ fingers were frozen. A good windbreaker or raincoat can do wonders in windy conditions. Sometimes she’ll get whiny about the cold more because she’s bored or tired or hungry. Then those issues need to be addressed or whining about cold will continue no matter how warm she is. 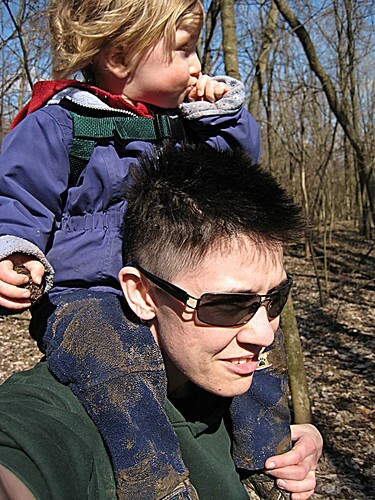 When she’s too cold (our poor planning), a shoulder ride or piggy-back shares some adult body heat. If that’s not enough, I have her cling to my front and wrap her into my coat. It’s resulted in mud in odd places of my wardrobe, but it’s a good way to share warmth and get her out of the wind. Carry spare socks and mittens. Dry shoes and a change of clothes in the car is never a bad idea, either. Your kid needs to be allowed to get wet, snowy, muddy. It’ll be easier on you if you know they won’t freeze on the way home and you can take them out in public if necessary. How do you keep your kids warm?